Earlier this month a Queensland man was flown to the Royal Brisbane hospital in a critical condition, having suffered severe facial injuries at the hands of an angle grinder. The man, in his 30’s was sharpening mower blades at Benarkin State School Oval on the Sunshine Coast when the blade broke off and spun into his face, shattering bones and injuring his eye. Had the man been wearing appropriate PPE, the extent of his injuries could have been greatly reduced. If you are an employer, you have a legal duty of care to your workers to provide a safe work environment. Part of this obligation is the provision of adequate PPE that meets the minimum standards of protection for any given task. PPE is a worker’s last line of defence against workplace hazards, when all other controls set up to minimise risk and protect the worker have been exhausted. Many workplace injuries can be prevented simply by ensuring your workers are wearing the right protective equipment. But what happens if a worker is wearing PPE and that PPE fails? When PPE fails and injury results, you as an employer could find yourself in breach of your legal duty of care, especially if there was any negligence in your selection of PPE, for example favouring cheaper, non-compliant products over certified, standards approved PPE. Even if legal action is avoided, injuries resulting from PPE failure can spark industrial relations disputes, significantly inflate insurance premiums and severely damage your company’s reputation. But why would PPE fail? Well, there are a number of reasons. Workers need to be sufficiently trained in how to fit and wear protective equipment. The onus is on the employer to provide workers with instructions and also to ensure workers follow these instructions. The effectiveness of PPE is greatly reduced if it is worn incorrectly or if it does not fit right. Fitting guides and instructions for all ProChoice PPE can be found on product packaging and in relevant sections of the ProChoice Safety Gear Guide. Most PPE comes with proper care, cleaning and storage instructions. PPE that is not correctly maintained can become damaged and ineffective. For example protective headwear is often thrown in the back of a ute or left in the heat in a car. Such actions affect the effectiveness of the protective headwear, and death or serious injury can occur as a result. PPE should be cared for, cleaned and stored according to the manufacturers instructions, with regular checks for damage. If damage occurs or the product exceeds it’s lifespan the product should be replaced immediately. Sometimes, wearing incompatible pieces of PPE together can greatly reduce the protection of both pieces of PPE. For example, if you wear protective ear muffs and safety glasses, the arms of the safety glasses can interfere with the seal of the ear muffs and thus reduce hearing protection. Rather than using protective ear muffs, a Class 5 earplug would be more compatible. Likewise, wearing safety goggles over a face mask or respirator can reduce the effectiveness of both if they aren’t designed to be compatible. See the ProChoice FilterSpec Pro Google-Mask Combo for an example of a compatibly designed breathing and eye protection apparatus. For more advice on choosing compatible PPE, talk to your supplier or contact ProChoice Safety Gear to speak to one of our knowledgable PPE experts. The PPE assigned to workers must be suitable for the nature of the work and any hazard associated with the work. A worker at a global manufacturing company recently sued his employer of 34 years for failure to provide him with the correct type of PPE resulting in personal injury. The worker was instructed to repair a hydraulic press and was using a jack to open it when his hands slipped due to the amount of oil on the equipment, causing him to fall and fracture his wrist. The gloves he was wearing were later found to be unsafe for use with oily materials as they did not have sufficient grip, and as a result the court found the employer liable. Talk to your supplier or contact a ProChoice representative for advice on choosing the right PPE for the hazard at hand. Standards Australia are a not-for-profit organisation charged by the commonwealth government with meeting Australia’s need for contemporary and internationally aligned safety standards. Their experts determine a set of specifications that products need to meet to ensure that they are safe, reliable, and perform as intended. In some states many of these standards are mandatory, in others they are voluntary but highly recommended. Where a standard is mandatory, there are penalties for supplying products that do not comply with them. 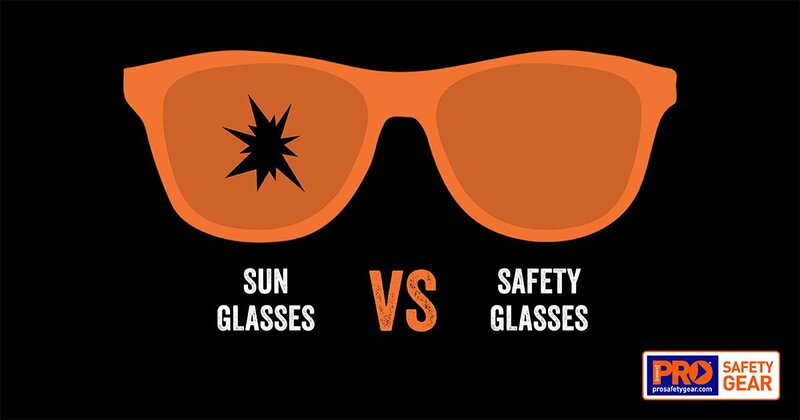 In WA, it is mandatory that all protective eyewear comply with AS/NZS 1337.1:2010 or AS/NZ1338:1992. Had the Queensland man mentioned above been wearing a ProChoice Assembled Browguard with Extra High Impact Shade 5 Visor – certified to Australian Standards and capable of withstanding impact from objects moving up to 190 metres per second! – his injuries from the angle grinder blade may have been avoided. If you are an OHS officer or the person charged with purchasing PPE for your work site, you are probably already aware of the relevant standards for your industry. However what you may not be aware of is that many PPE manufacturers do not comply with them. “Products that have not been independently certified to Australian Standards may not have been rigorously tested against potential dangers” said Richard Donarski, Team Leader of Health & Safety Product Services at SAI Global. During the manufacture of ProChoice Safety products SAI Global inspect the materials and production process, and products are batch tested for quality control. The Five Ticks ‘Certified Product’ StandardsMark™ displayed on ProChoice safety products, assures workers and the employers responsible for their safety that the equipment they choose has been rigorously tested and is fully certified in accordance with both recommended and mandatory Australian Safety Standards. So to recap, how do you avoid injury due to PPE Failure? Ensure workers receive adequate training on the correct use, fit, care and storage of their PPE. Ensure you provide workers with PPE that is both compatible and fit for purpose. Only buy products that have been independently tested and certified safe. Waiting for an accident to put PPE to the test compromises the safety of your workers. In real life when PPE fails, people get hurt. Independent testing catches such problems during the development phases, so you can have the confidence that the PPE your workers wear actually provides the protection that it promises on the packaging! Certification can be verified by looking for the below Five Ticks logo or relevant marking on the product and / or it’s packaging. ‹ Heat Alert! Another Stinking Hot One on the Cards for Aussie Workers in 2014	› Hazards in Confined Spaces – How Aware of These are You?